Among the cancellations in today's Notices and Proceedings Report is the significant withdrawal of a large number of Stagecoach Norfolk's services from 29th April 2018. Borderbus has given notice that it is to amend the timetable of its 146 Beccles to Southwold service from 16th April 2018. 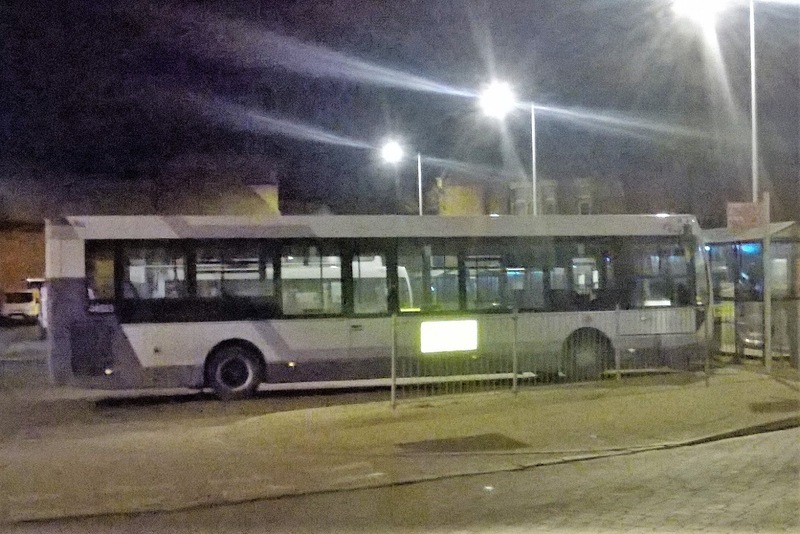 Way back in November 2015 I reported that First 66168 (W368EOW) had returned to Great Yarmouth from Essex to help out with the increase in the Bernard Matthews bus requirements. It was earmarked for withdrawal after Christmas and departed for Rotherham during January for an upgrade to become a paint spare. Syd Eade renewed his acquaintance with the former Great Yarmouth/Lowestoft vehicle when he had a ride on the Volvo B10BLE in Sheffield last week. His photo was taken alongside the now almost deserted bus station with most services seeming to use the city centre streets. My thanks to Syd for the report and his copyrighted photo. A quick run around the usual haunts in Great Yarmouth began this lunchtime with the viewing of First Great Yarmouth's Caister Road depot. Peering inside I observed another of the First Norwich fleet - this time Green Line Wright StreetLite 63319 (SK65PWZ) parked close to the depot entrance. I can only surmise that they were both present for their annual MOT/ inspections. Following Grahame's report about the three Enviro200s heading north of the border, I can now confirm that 45118 (VT09JPT) has left Great Yarmouth for Scotland following its MOT. Meanwhile, National Holidays Setra NH14PBH was observed on Marine Parade opposite the Wellington Pier. Had a couple of hours spare this morning so i thought i would try and catch up with the latest arrivals at Caister Road. All guess work as to what was working where but for once it all fell into place and within an hour i had grabbed what i needed with the camera. First up is 32672 SN55HEV which arrived last month from First Borders, seen above here turning into Northgate Street. Sister 32676 SN55HFD has also made the move down from Scotland and is pictured above on Barnard Bridge heading into Sandringham Avenue on the 8's. Recent transfer from Lowestoft is Dart 42943 WA56OAS, out today on the 4 service also pictured on Barnard Bridge. Finally a single deck allocation on the 8's today was Volvo B7L 66344 MV02VCX seen turning into the sunshine on Sandringham Avenue. Last weekend saw rail engineering work taking place between Brighton and Worthing and accordingly rail replacement bus services were put in place on both Saturday and Sunday. The final night photo is that of Go-Ahead London's Scania N230UD 956 (YR58SNZ) destined for Brighton. The last photo features Metrobus Scania Omnidekka/ East Lancs 6938 (YN56FDO) having just arrived at Worthing Station. During my week down south, I just had to look in at Brighton to observe some activity there and the following are the highlights of only a very short period of sightings. The first port of call was Steine Gardens where I noted Go-Ahead London's Scania N94UB/ Omnidekka 946 (YN56FEG) which was in an awkward location to photograph due to the position of the sun. I needn't have worried though as it was still in the same place some four hours later enabling me to get a better photo! It's the first time I had seen any of the Go-Ahead London fleet in Brighton (other than rail replacement) and was surprised why it was there for so long. Continuing our walk along North Street, I was passed by The Big Lemon Company's Alexander Dennis Enviro200 YX10FEK. 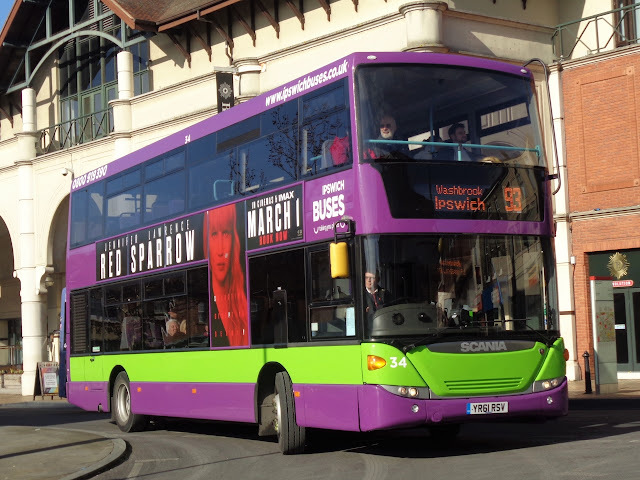 This is one of six former Abellio London 29 seaters recently acquired by the company who hope to convert them all to electric drive later this year. 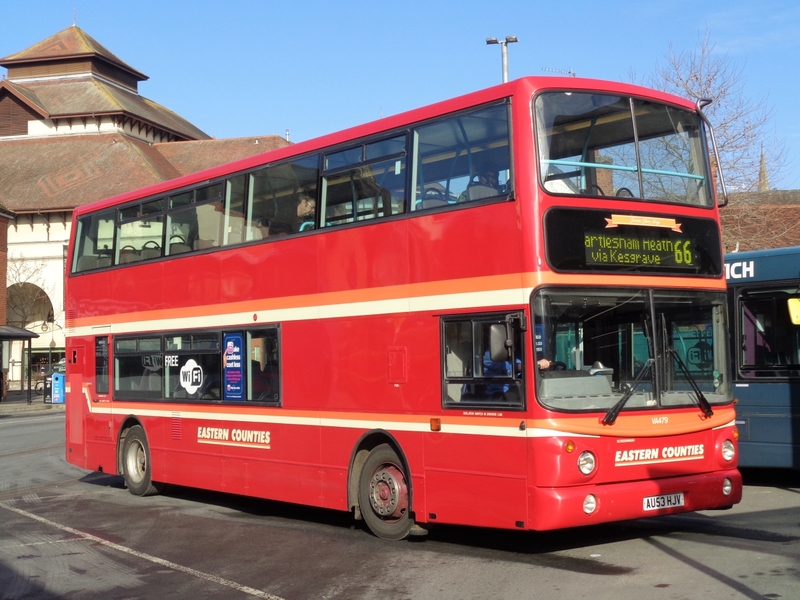 A recent arrival in the Brighton & Hove fleet is Wright StreetDeck 848 (SK67FLM). New in November last it is seen here heading for Portslade Station on the 49 route. Another decker sighted was Compass Travel's Wright Gemini bodied VDL LJ05GLV. New to Arriva London South as DW133 in April 2005, it was purchased by Compass in May 2016. All too soon it was time to return to Worthing and our Stagecoach South 700 Coastliner arrived fairly full at our Churchill Square stop. Naturally we headed upstairs and the only double seat available was right at the back. Fortunately this allowed for a rear view photo of Brighton & Hove deckers waiting behind us and the crawl back to Worthing saw me take in the views I wouldn't normally have seen had I had been driving. After four posts in one day we return to our usual level of activity with a post on yesterday's Notices & Proceedings Report published by the East of England Transport Commissioner. Last week (Monday 12th February to be precise) I decided to visit Worthing’s Compass Travel Depot situated in Faraday Close. I was warmly welcomed by managing director Chris Chatfield and after exchanging a few pleasantries he passed me on to a colleague who furnished me with a hi-viz jacket and took me out into the yard. Three things I immediately noticed were the introduction of a new fleet numbering system, two green interlopers and former Konectbus Wright Pulsar-Gemini bodied VDL YJ05PXA. 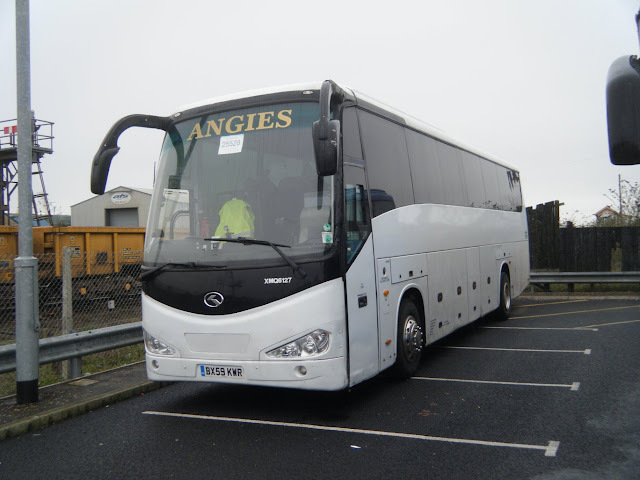 To the right of PXA was another DAF in the form of LJ04LFK which had been acquired from dealer Ensignbus in December. The interlopers were Seaford and District's Alexander Dennis Pointer Dart 504 (SD05SEA) and ADL Enviro200 402 (YX09FNJ). 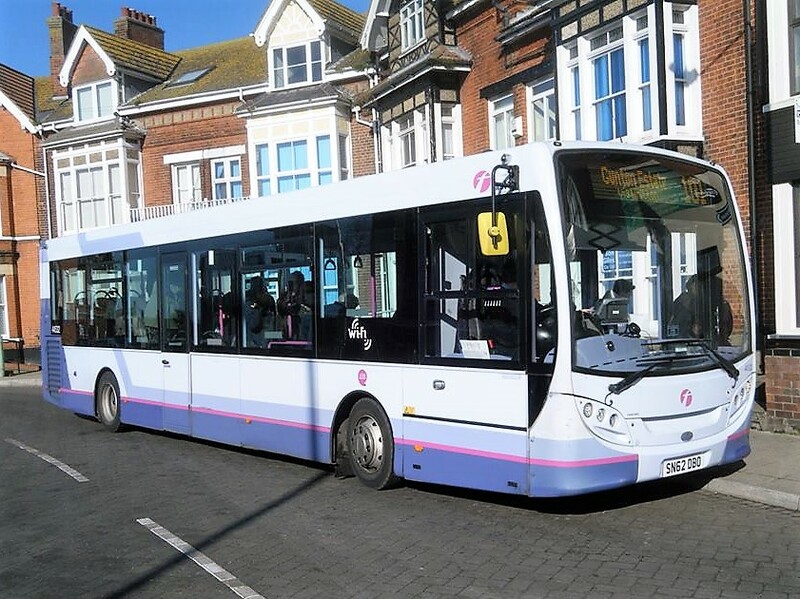 These were on loan to assist in the operation of routes taken over from Seaford in early January following the latter's withdrawal from bus operations. 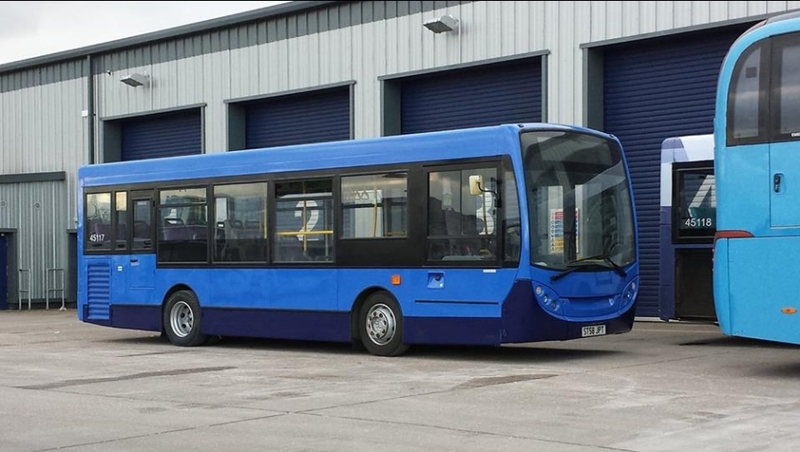 Also in the yard was another Alexander Dennis Enviro200, KX58GUJ, which had received the name 'Roger Knight 1945-2014' in respect of a former operations manager. On closer inspection one of the two vehicles on the forecourt was Transbus Dart VX05UHS which had been withdrawn in December for scrapping. It was, therefore, awaiting collection for its final journey. The repair workshop looked very busy with at least three buses being worked on with Enviro200 GX62CSF at the forefront. Once more my thanks to Compass Travel for a very enjoyable visit with some friendly and helpful staff in attendance. First up is Setra 312 (BK11COH) and I just about managed to get a photo just as it was moving away from its overnight parking spot. The other was Mercedes Benz Tourismo 851 (BF16XOZ) with its driver taking advantage of his later start! Regular blog contributors Cameron Robinson and Andy Swan ventured to Suffolk this past Saturday to sample the delights of Ipswich and Felixstowe. The weather was perfect for photography and Cameron has kindly sent us some photos to share from their day. First up is former First Borders Enviro 200 66776 SN62AXU which is now part of the Park & Ride fleet at Ipswich, seen above at Martlesham about to head into Ipswich. Next up is one of Ipswich Buses latest arrivals, 34 YR61RSV is one of a batch of ex London Scanias purchased to upgrade their fleet. These have been refurbished at Hants & Dorset Trim. 34 is seen above entering the Old Cattlemarket Bus Station. Finally we see VA479 AU53HJV "James 'Jim' Long" in the Old Cattlemarket Bus Station arriving from Martlesham on the 66 service. It has just been recently repainted and spruced up at Simon Morris. I know Jim would be proud to see his name in lights! Still miss his calls and emails, im sure he is still keeping an eye on whats going on! Thanks to Cameron for his excellent photos, hope you had a good day boys! Returning home after a week in Worthing I had the task of sorting through some photos I had taken whilst the better half was enjoying her hobby - shopping! On Friday last, however, a Coastliner liveried decker was employed on Worthing town service 10 from Durrington's Tesco store. Normally the preserve of single deckers, 15601 (GX10HBK) also worked the 14:45 return route 5. Earlier in the day I noted YX67UYE, one of Compass Travel's three new Alexander Dennis/ Enviro200's, working the 16 between Lancing and West Tarring. They join twelve similar buses delivered during the year where almost half of the 70 strong fleet now comprise ADL single deckers. At last one of the trio of the former First Berkshire Alexander Dennis Enviro200s finally made it into service during yesterday morning. Simon Bartram observed First Lowestoft's 44532 (SN62DBO) on the 10:19 am 101 service from Carlton Colville to Gunton Estate. 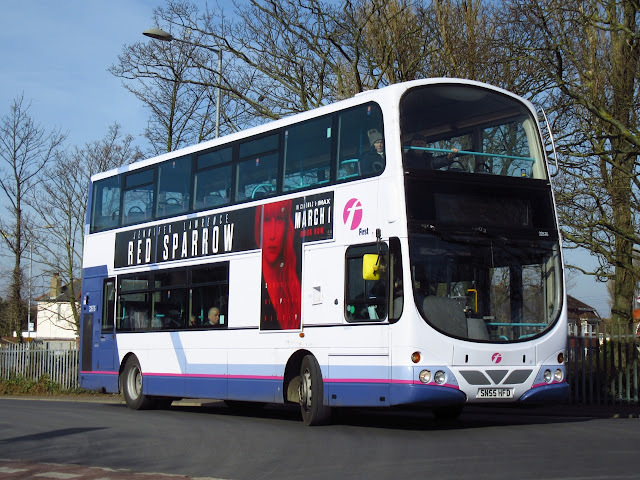 Today's Notices and Proceedings Report contains details of the cancellation of Anglianbus services and their replacement by Konectbus. Both have already been reported in an earlier blog post. 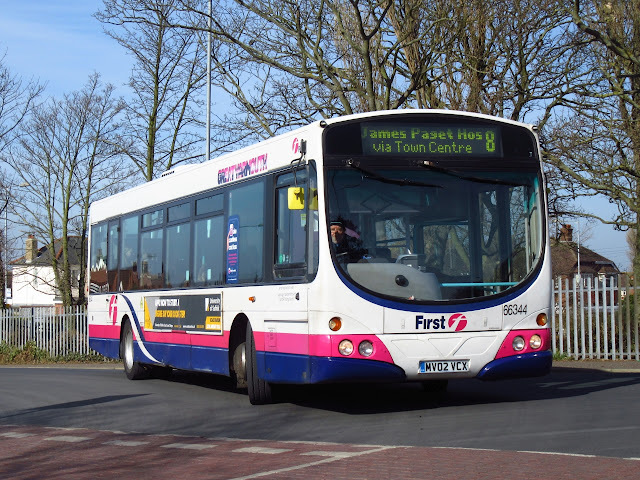 Today's Report also mentions the new Fakenham bus services registered by Konectbus and First Eastern Counties also highlighted on the blog last week. Other entries include a new operating centre for ten vehicles at Waveney District Council premises at Rotterdam Road in Lowestoft for Suffolk Norse. An operating centre has been closed by GS Group Holdings at North Road in Ormesby and replaced by another at Grove Farm in Rollesby near Great Yarmouth where authorisation has been given for three vehicles. Both Yarmouth and Lowestoft Lines are out of use for the next week which means coaches replacing Trains for the next seven days. 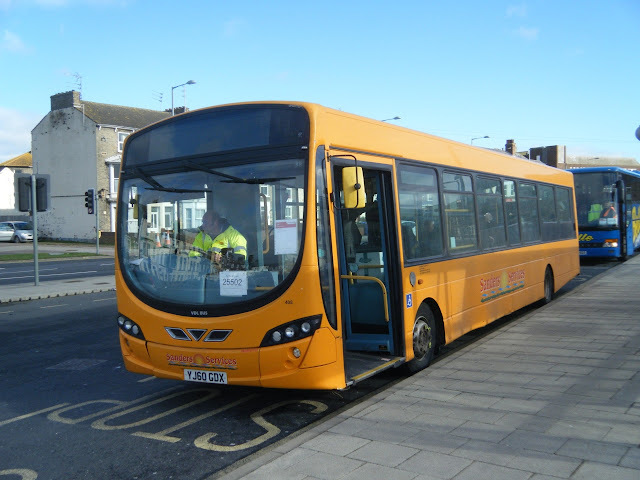 Simon Bartram was on hand at Lowestoft on Saturday to record which vehicles were on duty. 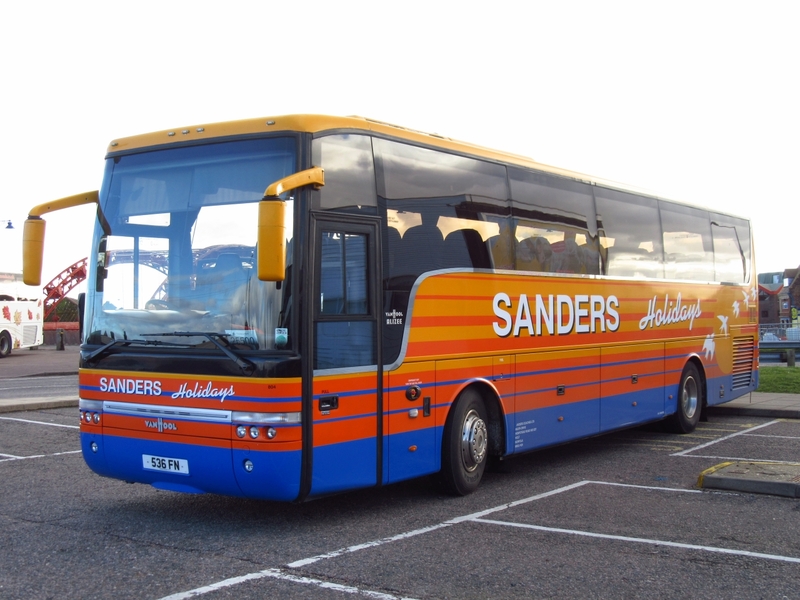 First up is Sanders Volvo/Vanhool 537FN (ex YJ07JWK) which employed just as sister 536FN was yesterday at Yarmouth Station. 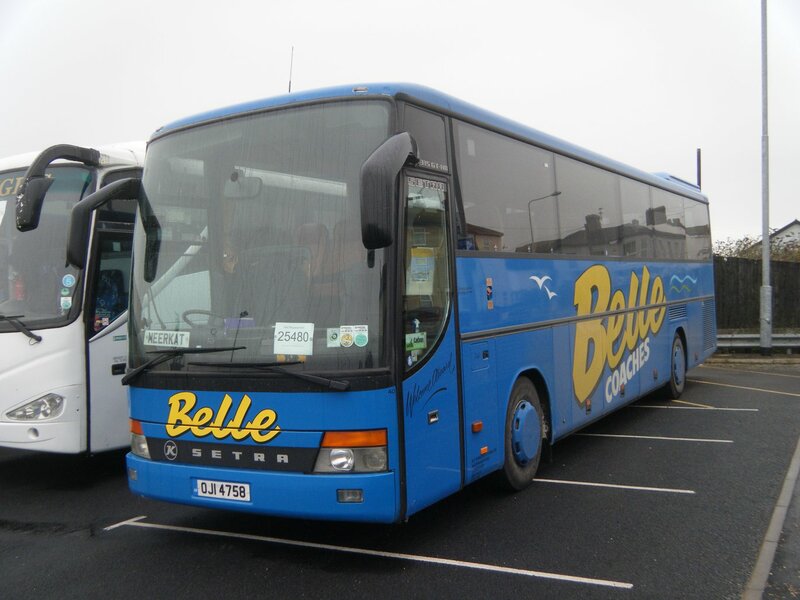 Next up is Belle Coaches Setra OJI4758 which was parked up in the Car Park awaiting its next duty alongside Angies Tours King Long BX59KWR. 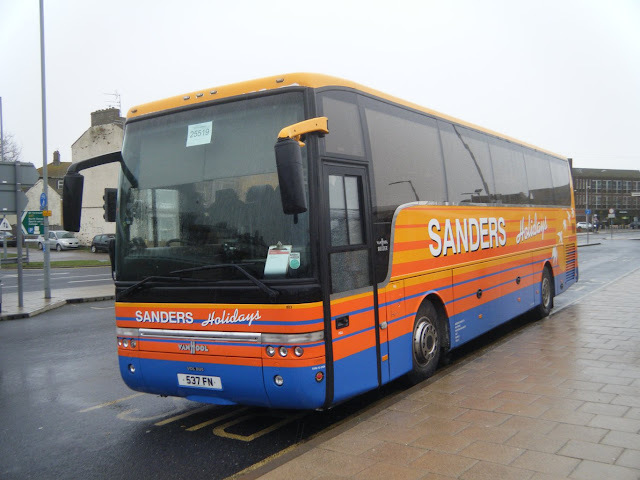 Finally Simon also managed to capture a very rare sight in Lowestoft yesterday morning (Sunday), one of Sanders Service Buses had made the trip to Lowestoft , DAF/Wright YJ60GDX was on hand to work the 11.50 replacement service to the city. Many Thanks to Simon for the use of his photos as always. 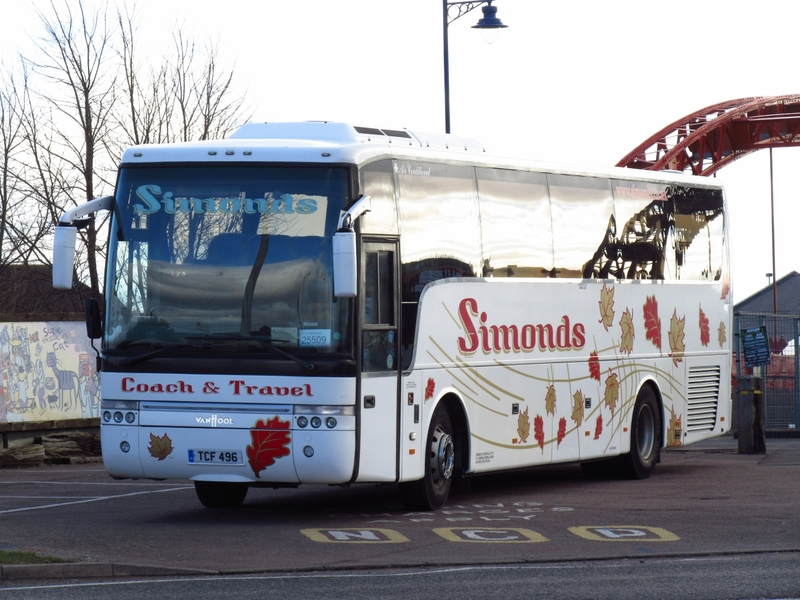 Only one Shearings visitor noted in the Town this morning, parked on the seafront was Mercedes Benz Tourismo 852 BF16XPB. A Morning trip to Asda for Breakfast supplies meant we could catch up with the vehicles employed on the Greater Anglia Rail Replacement from Yarmouth Station. 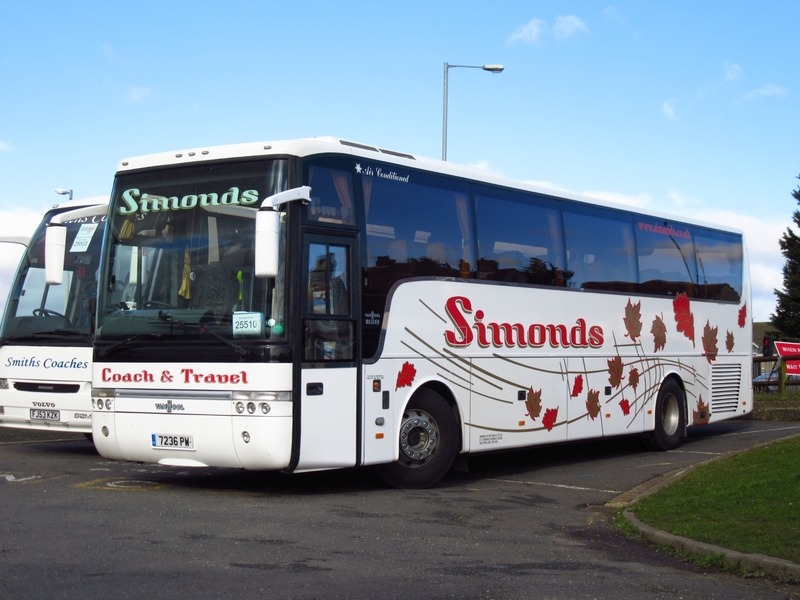 First up was Simonds Of Botesdale's Volvo/Vanhool 7236PW (ex MM06GSM) parked next to Smiths Of Blofield Volvo/Berkhof FJ53KZK. Another Simonds vehicle on duty was Volvo/Vanhool TCF496 (ex GM06GSM). The final vehicle noted was Sanders Of Holt Volvo/Vanhool 536FN (ex WK06AEC). Incidentally there were also two entries for Norwich to Fakenham bus services. Go West Travel registered its X29 Fakenham to Norwich service commencing on 3rd April 2018 whilst First Eastern Counties is also to introduce its 28 (29/X29) Norwich to Fakenham Oak Street service on the same day. So far unreported here is the arrival of three Alexander Dennis Enviro200s at Lowestoft's Gasworks Road depot. 44531 (SN62AZW), 44532 (SN62DBO) and 44533 (SN62DBV) came from First Berkshire earlier in the week and are in Olympia livery. The last named entered service yesterday. Whilst out and about in Great Yarmouth today I got my my first sighting of former First Borders 32672 (SN55HEV). 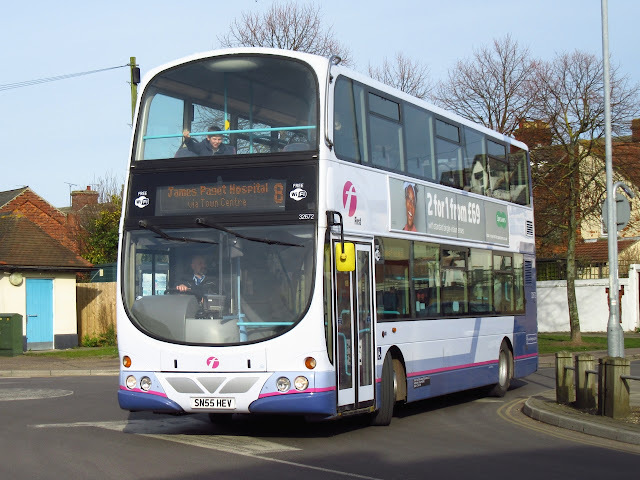 The Wright Eclipse Gemini bodied Volvo B7TL was being employed on First Great Yarmouth's route 8 this morning which operates between Caister Second Avenue and the James Paget Hospital in Gorleston. SN55HEV was new to First Edinburgh in September 2005. Following the publication of today's Notices & Proceedings Report, by the East of England Transport Commissioner, there are a number of alterations of interest. Firstly, the application by Hamza Hatukai of Godieta Court in Lowestoft has been approved for an operating centre for one vehicle at the Moor Business Park off Ellough Road in Beccles, subject to a number of conditions. Stephen Heels, of Newhaven Close in Cromer, is replacing the operating centre at Marretts Chariots Yard at Hall Road in Cromer with another at the Bluebird Garage Services site at Laundry Lane in North Walsham. The authorisation for the new centre is four coaches. 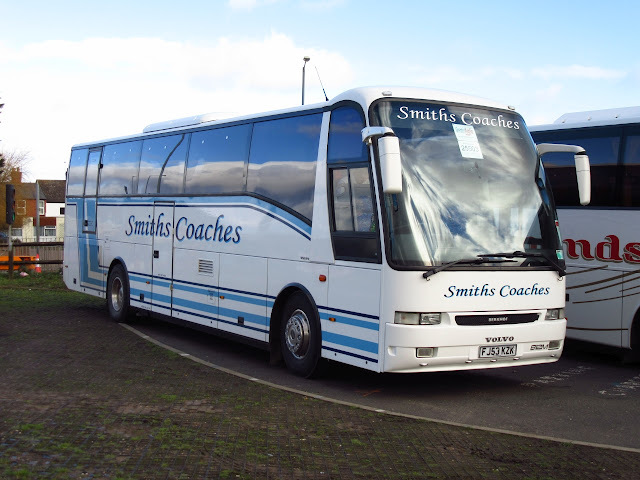 You may be aware that Bluebird Coaches was acquired by Maretts Chariots in 2011. Paul Whincop of Peasenhall has successfully applied for a new operating centre for five vehicles at Blyth Road Industrial Estate on Bramfield Road in Halesworth. This approval is also subject to a number of conditions. 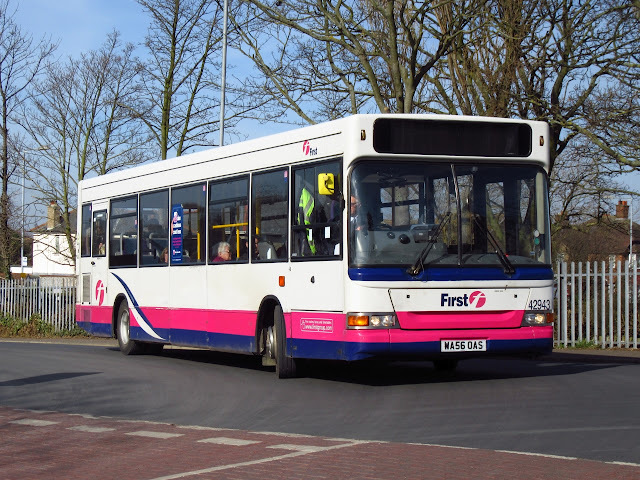 Finally, also recorded is an application by Go West Travel (trading as Stagecoach East) to amend the timetable of its X29 service between Kings Lynn and Fakenham from 26th March 2018. Today's search of the Government's East Of England's Vehicle Operator Licensing website has revealed five services being cancelled by Anglianbus (operated by Konectbus). This may be a tidying up exercise which may see Konect re-registering them. This morning I am able to provide some news of vehicle movements affecting the Great Yarmouth and Lowestoft area. 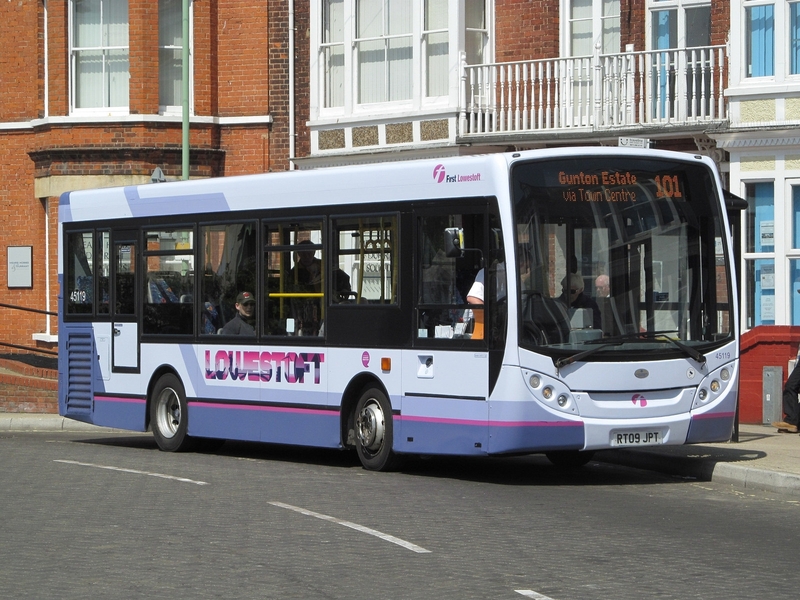 Firstly, ADL Enviro400 Excel liveried 33818 (YX63LKG) has left for Kings Lynn, whilst three Caister Road vehicles are also expected to be on the move soon. These now do not include Dart SLF 42919 (EU05AUL) but do involve the return of Volvo B7/Wright Eclipse 66348 (MV02VDC) to the Norwich fleet. 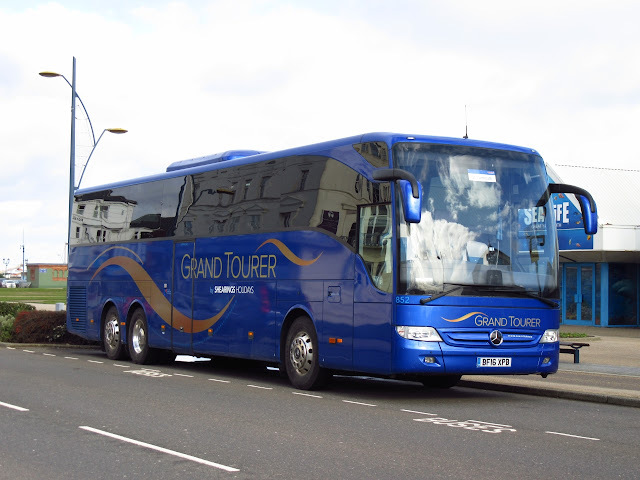 The other scheduled departure is Gemini 37574 (AU58ECY) which will take up residence at Lowestoft. 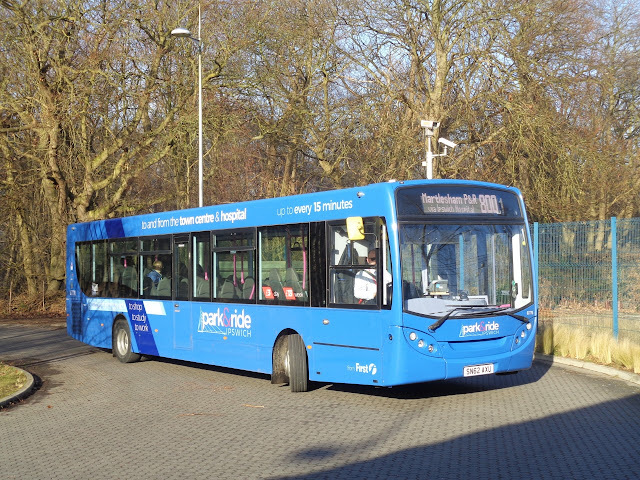 On the positive side, StreetLite 47504 (SN54CPY) is back on the road following repair whilst ex First Borders Volvo B7TL/Wright Gemini 32672 (SN55HEV) is entering service with sister 32676 (SN55HFD) following soon. Meanwhile former First Leicester ALX400 32063 (W223XBD) requires a new gearbox.